In various older texts on botany and gardening, it is said that ' … in Germany, Holly abounds in many forests… In France, it is abundant, more particularly in Brittany. The tree appears to attain a larger size in England than in other parts of Europe" Certainly, in the past there were large areas where Holly was abundant. For example, Needwood Forest in Staffordshire. This was a significant and ancient Midlands forest. However, the Enclosure Act of 1803 allowed for the felling of large numbers of trees; this took some time to complete. In his ‘Plant Book’, Professor David Mabberley notes that some 150,000 holly trees were taken from Needwood about this time, to provide bobbins for the cotton mills of Lancashire. (Bagot’s Wood is said to be the largest existing piece of this ancient wood). 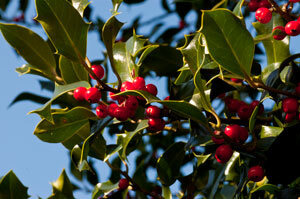 The leaves of Holly have a high calorific value and at one time were used as fodder for cattle or sheep. Holly was used as a supplement or replacement for hay when food was in short supply, or the land covered with snow so animals could not graze. 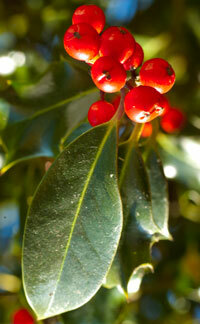 Holly was valued as it offered shelter to animals, woods or groves of holly trees (known as hollins) were not uncommon. It was the practice to lop some of the upper branches from the trees (for the sheep or cattle); this ‘pollarding’ did not harm the tree. Holly being essentially evergreen was able to provide some fodder throughout the winter months. 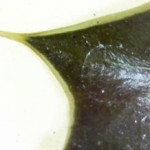 In some areas, there is some evidence that it was used to feed deer. But what of the holly prickles or spines? Surely these would deter all but the most hungry of animals? The leaves that develop at ground level are wavy, with large triangular ‘teeth’ bearing spines but as the tree grows (holly can reach up to 80 feet) the leaves become less spiny. To quote from Trees and Shrubs Hardy in the British Isles by W Bean (a former Curator of the Royal Botanic Gardens at Kew), “The tops of good sized trees will be found almost wholly furnished with quite entire leaves”. He goes on to suggest, “The spines are a means of protection against grazing animals, and are no longer needed when the trees become tall.” Hence, the practice of cutting branches from the holly some distance up the stem, where the leaves bore few, if any, prickles. The leaves of holly contain a bitter tasting alkaloid - ilicin. It is possible that this deters many leaf eating insects. Indeed compared to many trees the holly is not subject to sustained insect attack - though it leaves can harbour the holly leaf miner . This is the larval stage of a fly. 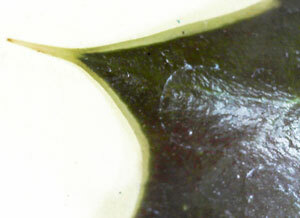 Its mining activities can cause local discolouration of the leaf - or the entire leaf may be affected. Another insect associated with holly is a butterfly - the holly blue, which feeds on its berries. Holly was also used extensively for hedging in gardens. For example, Evelyn's holly hedge at Say's Court, Deptford was recorded as being 400 feet in length and some 9 feet high. Holly was valued as it was impenetrable and durable, the disadvantage of using holly (as compared to hawthorn) was its slowness of growth. The wood of Holly was used in joinery, cabinet making, engineering, the making of mathematical instruments, wood engraving and veneering. The wood is essentially white (except for the heart wood) and accepts dyes readily - so when dyed black, it was sometimes used as a substitute for ebony (on the handles of tea pots). On the Continent, it was used in making whip handles and walking sticks. Holly has been used to decorate homes and holy places for centuries, indeed millennia. John Claudius Loudon in his Trees and Shrubs of Great Britain notes that evergreens were used in places of worship in pre-Christian times (pine, cedar, fir and box). Holly with its evergreen leaves (with their prickles) were placed at the entrance of a house because they were thought to stop ‘evil forces’ entering. In the Roman festival of Saturnalia, branches of Holly were used to symbolise 'good wishes'. An early reference to the use of Holly at Christmas time can be found in Stowe's 'Survey of London' (1598) which says 'every man's house, ….. the corners of streets were decorated with holme' (holme = holly). Various carols dating back many years also make reference to the use of Holly at Christmas. Holly, Ivy and Mistletoe are all associated with the festive season. All are evergreen plants, whose foliage tends to last quite well in garlands, wreaths and other displays. 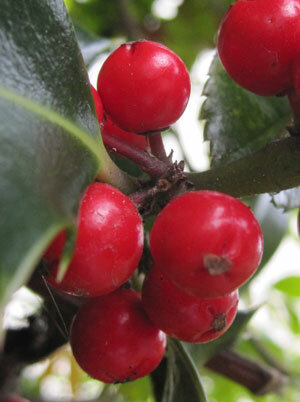 Whilst the berries of Holly are bright and attractive, they are also toxic. So Holly offers sheep fodder, hedging, woodworking opportunities and garlands; its many cultivars offer variety in the garden - and don't forget that it is said to predict a hard winter. I can honestly say I would never think of holly as being so useful! It is also noteworthy that in the art of heraldry holly represents truth.